Campaigns often require that client liner commitments are easily managed and reported on. Clear, consistent and correct communication of Liner information to the announcer is one part of the equation. Liner information can be scheduled and is easily accessible so that the announcer can be informed about specific campaign requirements. The streamlined processes result in a comprehensive audit trail allowing for reporting on date, time and whom a Liner was read by. 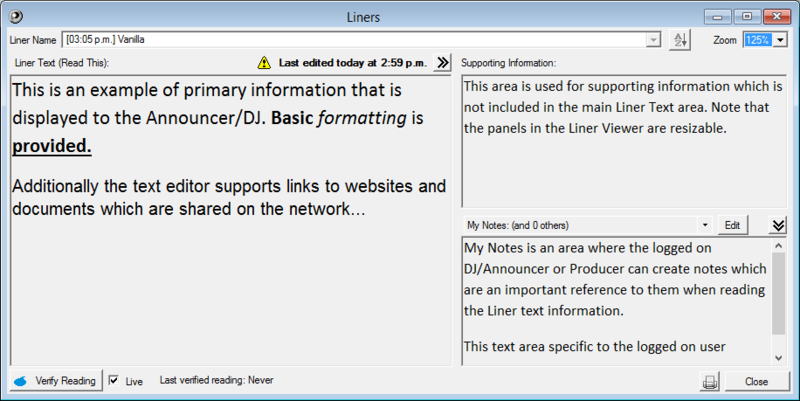 While the announcing team will benefit from the simplified way they can access this information, each user can tag their own notes when referencing a Liner. The administration team will appreciate that they don’t have to hunt through air-check logs to confirm when a Liner has been read… a big time saver.